From 1 April 2016, all employers will be required to issue itemised payslips to employees covered under the Employment Act. PayDay! 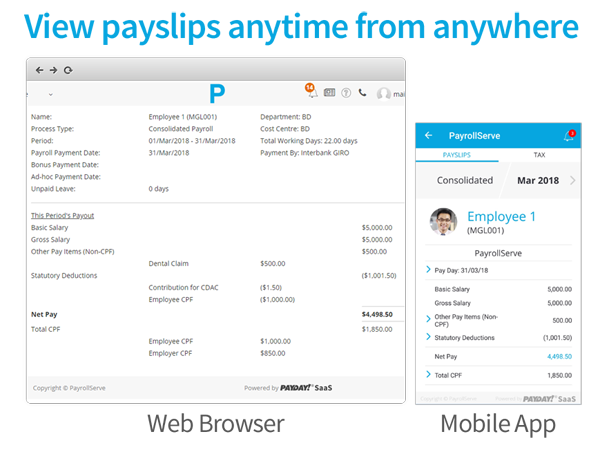 SaaS is a robust cloud payroll solution uniquely designed for Singapore SMEs or new business owners who have little or no experience in handling payroll for their employees. Itemised payslips can be automatically generated and delivered to your employees at a click. Your employees can view their itemised payslips securely via PayDay! SaaS mobile apps or any web browser. What Should Be Included in a Payslip?